The German Ambassador, Georg Boomgaarden, on behalf of the German President, Joachim Gauck, made the presentation. He recalled David Childs’s lifelong interest in Germany which began as a small child when his home town of Bolton was bombed in January 1941. Among the guests at the German Embassy reception were David Childs’s former Nottingham students Owain Blackwell, Neil Carmichae MP, Kelvin Hopkins MP, Dr Helga Hopkinson, Professor Marianne Howarth and Alan Spence. In his reply Professor Childs recalled how two bombs dropped only a stone’s throw away from where he lived narrowly missing the Odeon cinema, the largest in the country. A few days later he saw German prisoners of war about whom his father said, ‘They’re just like us, but they’ve been to the wrong school!’ Those experiences, and the many war films he saw as a child, made him curious about Germany. After studying as an undergraduate at the LSE, he was awarded a British Council scholarship to research post-war German Social Democracy at Hamburg University. A London University PhD on that subject followed. Some of the many people he met included writers Heinrich Böll, Stefan Heym, East German leaders Egon Krenz and Walter Ulbricht, West German Chancellor Helmut Schmidt, anti-Hitler pastor Martin Niemöller and General Hans Speidel, who, after being adjutant to Field-Marshal Erwin Rommel became Commander-in-Chief of NATO ground forces in Central Europe, and Stasi officers and their victims. He was shocked when he was able to have a private conversation with Prime Minister Margaret Thatcher, who, after making a positive speech about German achievements, revealed her hostility to German re-unification. This was just weeks before the Berlin Wall was opened. David Childs joined the Department of Politics of Nottingham University in 1966 after working as a journalist for ATV. He retired as emeritus professor in 1994. He has continued to write and lecture on German affairs. His post-‘retirement’ books include, The Fall of the GDR, with Dr Richard Popplewell, The Stasi: The East German Security and Intelligence System, The Two Red Flags: European Social Democracy And Soviet Communism Since 1945 and novel, We Were No Heroes. He also writes on British politics. The 7th edition of his Britain Since 1945 was published by Routledge in 2012. Professor Childs is also a frequent contributor to The Independent and other publications. He had given lectures at many universities in the UK, Germany, the USA, Australia, Iceland, and most recently, Italy, on German affairs. He also gives talks to voluntary groups such as Anglo-German associations, business groups, schools and colleges. 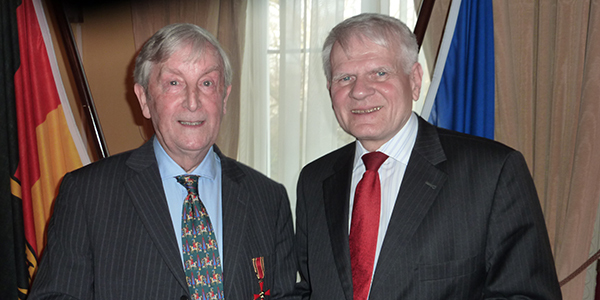 Professor Childs is photographed with the German Ambassador Georg Boomgaarden. 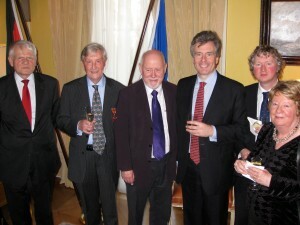 The group picture features – from left to right – Georg Boomgaarden, Professor David Childs, Kelvin Hopkins MP, Neil Carmichael MP, Owain Blackwell and Professor Marianne Howarth.